Superman is 80 years old. Thor's over 2000 years old. That's an intimidating history to have to bring to life. There's a whole lot of history: the Norse mythology and also the history of the comic books, itself 50, 60 years' worth. Both of which has been around longer than I have, and there's a whole lot of things to get right—and to get wrong. That would have added to the pressure walking into it, but to be honest the excitement of working with the other people that were involved and a character like this-that outweighed any of that trepidation. Kenneth Branagh taking the reins almost gives it this weight that it wouldn't have with a different director. I think the same thing and why I was so excited to be involved in the taking on of something as big as this. Marvel certainly knows what they're doing with their films. There's these comic books that they've always kept them extremely popular, and throwing someone like Ken in who has this incredible take on character and story and a very thorough background-and obviously his Shakespearean Old English sort of world, as there's an element of that in Thor. It's sort of Thor's family was the royal family of the universe, in a sense. On set, the focus wasn't on the special effects or what have you. I mean, that was certainly taken care of by the experts, but with Ken, it's so much collaboration with character and story and simplifying that into something unusual. Thor has human frailties and a temper, but he's also an honest-to-god deity—that's rare in the superhero world. How did being a god figure into the way you played the part? I think our focus was on humanizing it, in a sense. He's a God and he's in another world and it's sort of easy to get lost in the size of it all and miss the more intimate stuff. Ken all the time was like, "Look, this is a scene between a father and son, or two brothers, or a complicated romance." That's stuff we actors can relate to-and also an audience can. That was one of the big focuses and I think a lot of why the film works is because there is a grounding of intimacy to it. You have to hold your own as an actor in scenes against Anthony Hopkins, but at the same time take on such a physical part. Growing up in Australia and the Bush with two brothers and building forts and various weapons as kids certainly helped in the physical side of things. The training I've done helped, but the biggest thing was Anthony and Ken simply walking on set and no one having to feel they had to say, "I am who I am. Respect me and do this." It was just a very even playing field, very supportive. How heavy was the hammer? It had a bit of weight to it. I think it needed to because if it was too light, when we're doing various stunts and stuff, it didn't look like it had any power. If you're actually holding something with some weight to it, your body and mechanics need to move differently to support it. And then watching the footage, it looks like a big powerful weapon and not a toothbrush that you're swinging around. I didn't get to keep it. I would have liked to. Missed my opportunity to smuggle the thing out the door. And I have to ask: how practical is a hammer as a weapon? Not really! If it's a magic hammer, then there's a different conversation. For us, we found we used a lot of broad sword techniques, but also used it like an extension of the body. It was kind of like a fist, in a sense, because it's short. It doesn't have the length of a sword. I boxed for years and I think that background certainly helped with the mechanics of throwing it around. I also looked at the comic books and how Thor holds himself and moves and tried to mimic that stuff. I don't want to necessarily start a geopolitical fight, but I think it's really interesting that of the latest crop of Hollywood action heroes, a lot of them are from Australia, a lot of them are from England and none are from America. Why are your countrymen so much tougher? There's quite a few from America! There's Captain America, obviously! There's Iron Man and the Hulk. I don't know. I think part of it is we get to have a career in Australia and build up a resume and get a lot of hours of experience and then come here as a fresh face. There's Spider-man and Superman and they're all over the globe, I think. Thor wasn't American, so I think that opened the door for me. The character was Nordic and obviously from another world, which Australia kind of is. You moved to America just a couple years ago and by 2009 were announced as Thor and had a memorable gig as Captain Kirk's dad in Star Trek. What's that whirlwind of attention been like? I very often pinch myself and say, "Wow!" I was always planning to move to America—it's where I wanted to end up and this is what I wanted to do—but there was also another voice in my head going, "Eh. The odds are against us." Your long blond hair was a wig, but did you have to bleach your eyebrows? There was all sorts of bleaching, yeah: my beard, my eyebrows, the hair. It was quite a transformation. It's funny watching myself on screen. Even normally it's always a difficult sort of thing as an actor, but I looked so physically different that I said, "I don't even know who that guy is!" I got my confidence between cringing in the chair covering my eyes. Do you get to go Berserker? I did. I had Ken say that to me a few times, "This is the Berserker Thor." We'd try different versions and then he'd say, "We got that, now let's do Berserker Thor"—that exact word. How do you become Berserker Thor? There's a sense of mania or fun. It's a combination; it's not just anger or rage. I think you have to do anger/rage with a smile. 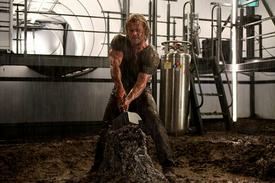 Thor relishes in war. That's what he lives for, certainly early in his life. Here, you have a movie to yourself. But you're shooting The Avengers against scene-stealers like Robert Downey Jr. and Samuel L. Jackson. How does Thor play among a more crowded field of costars? I just have to make sure that I have the brightest cape and the biggest costume—pay off the wardrobe chair. No, it's incredibly exciting because these characters have been established on their own, we've watched them grow and establish themselves, and now to have them all together is such an interesting mix. Obviously, there's all these talented actors, so it's interesting. On paper, these characters, these comics have existed for many years. I've met all of the guys and they couldn't have been nicer, all of them. I think everyone's just as excited to jump into it. There's a line where Thor says that magic and science are one and the same. Tell me more about that connection and how it plays as a theme in the film. I think what Thor's talking about is that you can label things magic or science or religion or whatever, but where he comes from there's no difference. There's the world of Viking mythology and there's also science fiction. It's another universe. He comes from another realm where the unimaginable is normal. Thor moves from the hallowed halls of Asgard to Earth—how does Thor fit in on Earth and how did you handle that tonal change? Well, Thor doesn't fit it, really. I think the film has very much a fish-out-of-water feel to it and I think it leaves some room for comic relief. You have a very oppressive character that is used to having his own way and having the universe at his fingertips, and all of a sudden that's not the case. But that was the goal-to play that truthfully, and that's where the fun happens. Does your family have any Viking? Nah. Not really. I have a English, Irish, Dutch-eh, maybe. If we look further back, maybe somewhere. In Australia, we're convicts. That's our little bit of Berserker.